When I first saw Evergreen in the thrift store I was immediately intrigued. The music theme was interesting as you don’t see a lot of board games that utilize a music theme. The main reason I was excited to try out the game though was due to the game’s designers. Evergreen was a joint production between Michael Kiesling (Azul, Tikal, Torres) and Wolfgang Kramer (El Grande, Heimlich & Co, Princes of Florence, Tikal, Slide 5, and Torres). Evergreen even has an interesting backstory as Kiesling and Kramer designed Evergreen through phone calls and faxes and actually never met in person while designing the game. With such a pedigree of two great designers who have made great games together, I had high expectations for Evergreen. Evergreen is a solid game with an interesting theme and some unique mechanics, but it doesn’t live up to its pedigree as it feels like something is missing from the game. Place all of the disks in the center of the table. Position the small disk in the center so the tone arm points to the five. For the hit record disk, point the tone arm to the orange space. If there are less than five players, you will remove some of the cards from the deck. 2 players: remove numbers 6-13 of each color. 3-4 players: remove numbers 10-13 of each color. Shuffle all of the remaining cards and deal 13 to each player. Any cards that aren’t dealt out are returned to the box as they won’t be used. Place the sand timer near the center of the table. One player will be chosen as the score keeper who needs a sheet of paper and a writing instrument. Before the game begins, all of the players will play a pre-game round. In the pre-game each player will play three of the cards from their hand face down in front of themselves. This will form three piles which they will use throughout the game. Players can play whichever cards they prefer as there are no restrictions on what cards a player can play. After everyone has chosen their three cards, all of the players flip their chosen cards over at the same time. 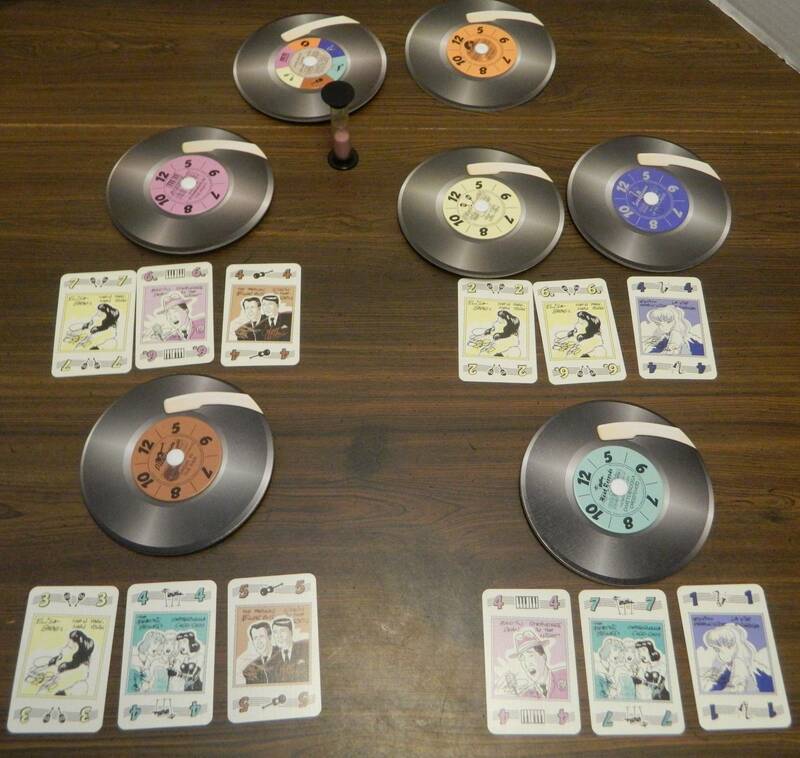 The players will then determine which player will control each disk (see the Influence section below). Each disk that is given out will keep the tone arm pointed towards the five. Any musician that no one played a card for, stays in the center of the table. All of the players have played their three cards. The top left player will control the pink disk since they played the highest pink card. The top right player takes the dark blue disk as they played the highest card. They will take the yellow disk because the total of their two yellow cards is higher than any individual card. The bottom left player will take the brown disk as they are the only player to play a brown card. The bottom right player played the highest light blue card so they will take the light blue disk. Whichever player has the lowest total influence will start the game. If there is a tie for lowest influence, the tied player closest to the left of the dealer will start. This player takes the timer and the hit record disk. 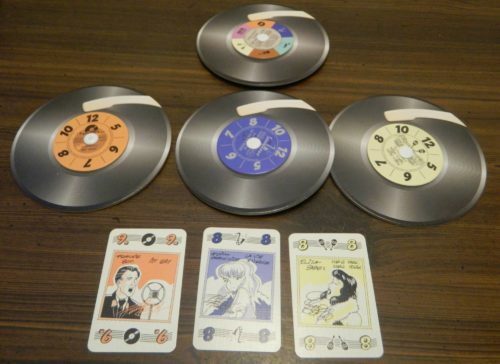 Each player begins their turn by flipping over the sand timer. The player will have until the timer runs out to complete their turn. On a player’s turn they can play between one and three cards. A player can either play a card on top of one of their own piles or one of their opponent’s piles. A card can be placed on top of any pile as it doesn’t have to match the color or number. Whenever a card is played, the players have to check its impact on influence (see the Influence section below). After playing cards, the player can choose to keep the hit record on its current space or move it one space to the left or right. The hit record is currently on dark blue. The current player can either keep it on the dark blue or move it to the orange or light blue spaces. Finally the player decides whether they want to hold a concert (see Scoring below). The player has to announce whether they want to hold a concert before the timer runs out. They don’t have to complete scoring before the timer runs out though. After a player has completed their turn, play passes to the player on their left. If there is still time left on the timer, the next player can use it addition to their normal amount of time. If a player runs out of time and didn’t play any influence cards, the player on their right randomly takes a card from the current player’s hand. This card is placed on top of the current player’s center pile. The players will then determine how this impacted influence. The current player is unable to hold a concert. The key to Evergreen is your influence over different musicians. Your influence over a musician is dependent on the cards on the top of the three piles in front of you. You determine your influence over an act by totaling the cards in front of you for each color. The player who has the greatest total in a color will get to take control over the corresponding disk. If two or more players have the same influence over an act, the player with the higher valued card will have the most influence over the musician. Whenever a card is played the players have to determine the change on the overall influence on all of the colors that were impacted. All of the players count up how much influence they have over the color(s) that were impacted. If a new player has the largest influence over a musician, the corresponding disk is moved to that player. Whenever a disk is moved, the dial is turned one space to the right (5-6, 6-7, 7-8, 8-10, 10-12, 12-5). The player on the right had control over the yellow disk with their total of eight versus the left player’s seven. The left player played a pink one on top of the yellow six. As the left player now has the most influence over yellow, they will take the yellow disk. As the yellow disk switched players, the dial is turned to six. If the only influence card for a given color/musician is covered up, the disk remains with the player who controlled it last. During a player’s turn, they can choose to hold a concert which will score them points. During the game each player can hold three concerts. There is also a fourth concert that all of the players will participate in at the end of the game. When a player calls a concert, they are the only player that will score points. When holding a concert the player will look at the disks they have in front of them. Each disk they control is worth the amount of points that the tone arm is pointing toward. 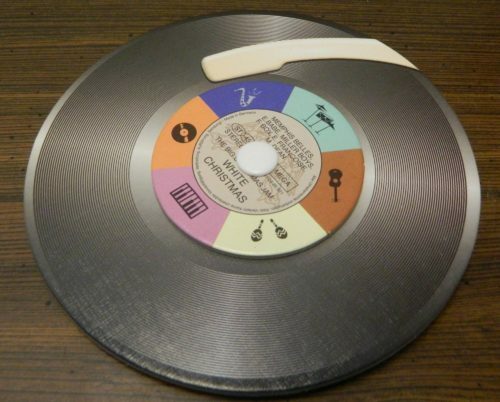 If a disk is the color that is pointed to on the hit record disk, all points are doubled for that record. The hit record is not used when scoring the final concert. Each player also has the opportunity to make one of their three concerts or the final concert their gala concert. Once a player has chosen a gala concert, they cannot change it later. During the gala concert the player will double their entire score for the round. This player has decided to hold a concert. They currently control three of the disks. The player will score 24 points from the orange disk (it is currently the hit record), 8 points from the dark blue disk, and 10 points from the yellow disk. The player will score a total of 42 points. If the player chose this for their gala concert, they will score 84 points. The game ends when all of the players have run out of cards. The players will hold the final concert and add the points to their score. The player who scored the most points during the game wins. If two or more players tied, the tied player who scored the most in the final concert will break the tie. As I mentioned at the beginning of this review Evergreen has quite the pedigree behind it. 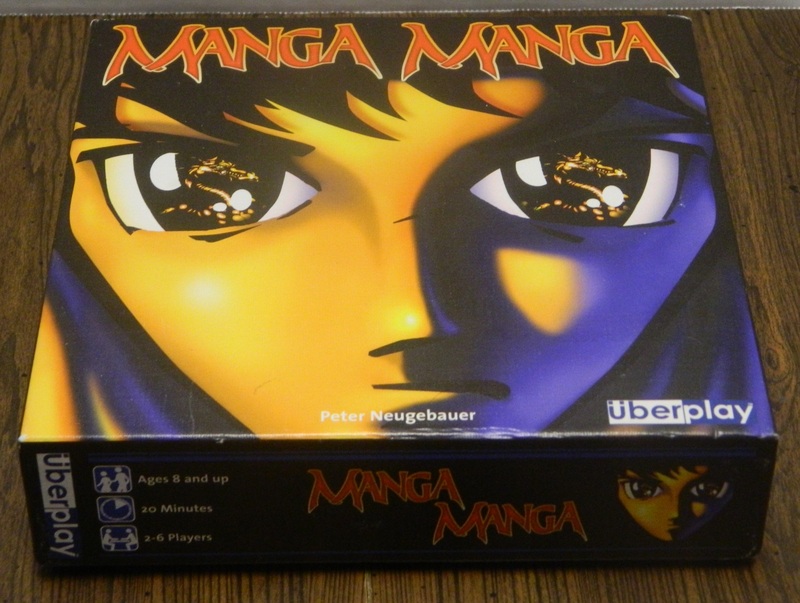 Most board games have one designer and rarely an award winning one at that. Evergreen had two award winning designers in Michael Kiesling and Wolfgang Kramer. Both have won Spiel Des Jahres awards of their own but they are also well known for working together on projects. They actually won two Spiel Des Jahres awards together in 1999 (Tikal) and 2000 (Torres), conveniently at the same time that Evergreen was also developed. Evergreen is a decent game but it doesn’t reach the levels of Kiesling’s and Kramer’s award winning games. 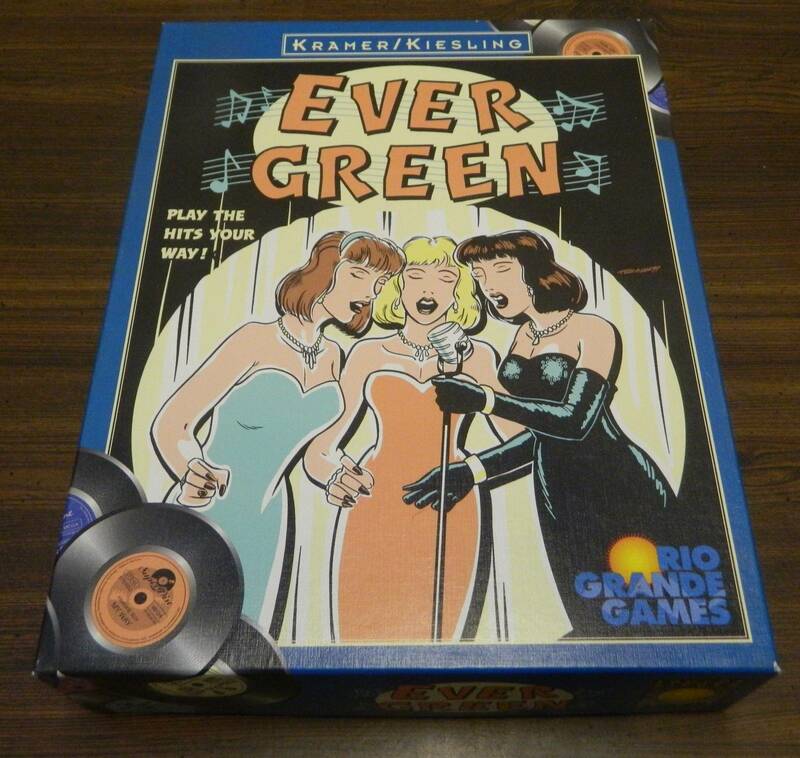 I would say that Evergreen doesn’t fit neatly into any board game genre as it is a combination of a couple different genres. I would say that its main genre is that of a card game. Most of the game revolves around managing the cards in your hand and choosing when and where you should play them. The game also has some speed mechanics as there is a time limit to your turn. You have one minute to complete your entire turn outside of scoring. The final main mechanic is an area control type mechanic. Basically the goal of playing cards is to maintain control over as many of the musicians as possible. For the most part the strategy in Evergreen is pretty straightforward. You basically want to play high value cards on your own piles while playing low cards on the other players’ piles. Your goal in the game is to gain control of several of the disks on your turn and then score the round. This mostly involves analyzing each players’ total in each color. You then play cards in order to have those totals work in your favor. As the disks are always moving, you need to keep the current situation in mind before making any decisions. As the players are only given cards at the beginning of the game, smart use of your cards is key to the game. Once you use up your cards, you can’t do anything for the rest of the game. With a limited number of cards, it is impossible to always be in control. Control over the disks ebbs and flows throughout the game. There are rounds where you will control several disks and other rounds where you won’t control any disks. You basically have to choose your shots and then back off and regroup in a future round. You won’t be able to play three cards every round to maintain your position as you will quickly run out of cards. You don’t want to run out of cards early and just sit by while the other players rack up points with their remaining cards. This brings me to the key strategy of Evergreen, timing. The player that ultimately wins the game is going to be the player that times their moves correctly. As you can’t make a move each round, you need to time the rounds where you make your moves. You don’t want to make your moves too early but you don’t want to wait too long either. In order to score the most points you need to make your big moves on the turns that will score you the most points. The reason timing is so important is due to how scores are calculated. The value of each musician is determined by the number that the dial is currently turned to. At the beginning of each game all of the disks are turned to five. Each time the disk changes hands, the value goes up. The catch is that the disks eventually reset back to the lowest value. You basically have to time taking a disk to coincide with when it is at its highest value. Scoring one or more disks at their highest value is huge in the game as the highest value is worth over twice as much as the lowest value. A player that is able to score two or more disks at their highest values on a turn is going to have a really good chance at winning the game. It might not seem like it at first but one or two moves could be the difference between winning or losing the game. Before playing the game I thought this was a really interesting gameplay mechanic. The problem is that outside of your own turn, you have no impact on the game. Evergreen is one of those games where you could make a brilliant move on your turn and it could be entirely erased by your next turn. Your fate in the game actually depends a lot on the other players. If the other players avoid you for the most part, you can do quite well in the game. If the other players regularly take your disks, you are going to struggle in the game. Between your turns you basically have to just sit there and hope another player doesn’t mess with your strategy. While there is quite a bit of strategy on your own turn, it can be mitigated pretty quickly by the other players without having any way to stop it. On top of this there is a pretty big reliance on card draw luck. While the game does a better job than most at giving all of the cards value, there are cards that are better than others. Being able to play low cards on other players give the cards some value but high cards are usually going to be better. If you are dealt a hand with a bunch of low cards, you are going to have a hard time scoring a lot of points. You can lower the value of the other player’s hands, but you aren’t going to take control of many disks if you only have low cards. If you are dealt a hand with a good mixture of high and low cards or a hand of all middle and high cards, you are going to have a good chance of winning the game. If you are dealt only low cards, there is very little strategy can do to get you out of your predicament. One mechanic I really haven’t talked much about is the speed mechanic. This is mostly because I don’t know what to really think about it. I think the timer was added to the game for two reasons. First it helps reduce analysis paralysis. With only one minute to make all of your moves, you don’t have the time to analyze every potential move. This shortens the game quite a bit as you don’t have to wait around for players that always need to find the best option. The timer also introduces the possibility of players making mistakes. As you are rushed to make decisions, you are not going to see all of the potential impacts your decision will have on the game. This could lead to you making a sub-optimal move or even a move that ultimately hurts you. What is interesting about the speed mechanic is that you can easily remove it from the game if you want. If you chose to not use the timer, it doesn’t drastically change the game. The gameplay is exactly the same. You just have more time to make your decisions. In some ways I think this improves the game and in other ways it makes it worse. On the positive side it makes the game less stressful. You can think out your options instead of rushing to complete everything in one minute. Without the stress of having to decide quickly, I think it would be best to teach the game without having the timer for the first game. The problem with eliminating the timer though is that it removes some of the excitement from the game and it introduces the possibility of analysis paralysis taking over the game. In addition to the speed mechanic, I have some mixed feelings about the theme as well. At first I thought the theme was pretty interesting. There aren’t a lot of board games about the music industry. Basically each player in the game is a concert organizer that is using their influence over different acts to get them to perform at their concerts. This is an interesting theme that I haven’t really seen used in other board games. Some of the mechanics the game introduces even seem to do a pretty good job supporting the theme. The problem is that the theme feels extraneous at times. You could play the whole game without knowing the theme and it wouldn’t drastically change the gameplay experience. The theme isn’t distracting and it doesn’t hurt the game, but I think the game could have done more with it. For the most part I would say that Evergreen’s components are quite good. The disks are well made utilizing pretty thick cardboard. At times it is hard to tell which spaces the tone arms are pointing to. The cards are pretty good as well since they are of a pretty high quality. I really like the game’s art style as it works really well with the game’s theme. I just wish there was a little more variety in the artwork as all of the cards for each color use the exact same artwork. At the end of the day I had fun with Evergreen. It is a solid speed card game. The game is easy to pick up and play. There are interesting mechanics and there is enough strategy to keep you interested. The key is to choose the right time to strike when the disks are most valuable. Using your cards in the right way will increase your odds of winning the game. The problem is that outside of your own turn, you have no control over your fate in the game. Players can mess with your strategy and you have no recourse until your next turn. There is also some reliance on luck as the cards you draw will impact your chances in the game. There are a lot of things that I liked about Evergreen. I just think the game is missing something that keeps it from being as good as it could have been. 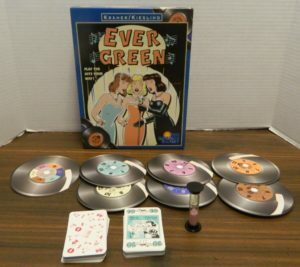 Overall Evergreen is a solid game that most people should have at least some fun with. If the concept doesn’t really appeal to you, I would probably pass on picking it up. If you already have a similar game that you enjoy, Evergreen is not unique enough to warrant a purchase. If the game sounds interesting to you and you can get a good deal on it, I think it would be worth picking up Evergreen. Has some unique interesting mechanics. Easy to play and has a decent amount of strategy. Card draw luck can have an impact on the outcome of the game. Your strategy can be ruined on other players' turns and there is nothing you can do to stop it.